Slurp away on delicious broth and perfect noodles! Chances are big you are hung-over after a big New Year’s celebration? I know I am… What better way to kill your hangover than with a delicious filling soup! Japanese ramen will perfectly hit the spot! I can hear you thinking: “Ramen?! Aren’t that those square packages with a noodle block and some soup powder?” Probably that’s indeed the most common known variety known to most Europeans. When I was still studying I literally lived on packaged ramen with some veggies thrown in. A few years later, in Amsterdam I had my first bowl of proper Japanese ramen. I can still remember the exact words I said to my friend with whom I was eating out: “This is the tastiest water I ever had!”. Unbelievable pork broth, chewy noodles, delicious crunchy shredded pork as topping. Ever since then I wanted to recreate this dish – and I finally did! Pork broth cooked overnight, delicious noodles, topped with egg and pulled pork that was caramelized with brown sugar, fish-sauce and soy. Soooo good! The recipe underneath is a more basic version of ramen. You can vary it however you want. Add the toppings you like: Think about a soft-boiled egg, shredded meats, grilled fish, shrimp, veggies like carrots, cabbage, pak choi, bean sprouts, spring onions, etc. The possibilities are endless!! Try to make your broth from scratch if you have the time. It will have much more depth than a stock cube, especially if you poach a piece of chicken or pork in it. However, I also know that time is limited, so you can also take the middle way and use stock cubes together with some fresh ingredients. If you are vegetarian, you can however easily make a vegetarian broth as well. All the toppings you like! Veggies, shredded meats, grilled fish, a drizzle of chili sauce, etc. Add 1 liter of water to a pot, add the stock cubes, soy sauce, grated ginger, garlic, and bring to the boil. In the meantime, slice a leek into thick rings and roughly dice the carrot. Add the veggies to the stock and cook for 5 minutes. Filter the soup through a sieve to get rid of the cooked-out leek and carrot. Cook the ramen noodles according to the instructions on the package (about 3-4 minutes). Afterwards, drain them in a colander and rinse with cold water to stop them from cooking. Slice the spring onions at an angle to get thin rings. 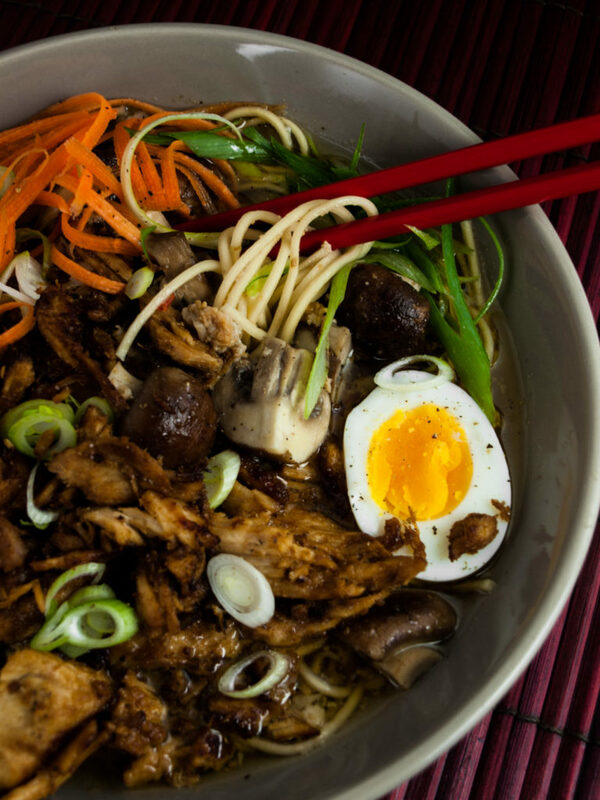 Divide noodles among bowls, pour over hot broth and add all the toppings you love! Sprinkle with the sliced spring onion and slurp away! Let me know in the comments what you think of the recipe! What are your favorite ramen toppings? Have you ever made broth from scratch? Do you think real ramen noodle soup needs another crucial ingredient? Leave your comments and help to make this even better!